If you have had enough big budget CGI and special effects movie versions of this epic story of Middle Earth, this small community theatre production might just be the thing for you. At just under three hours, it felt a little long, but the actors are obviously having so much fun that you cannot help but admire their energy. This quest of a play follows the reluctant Hobbit, Bilbo Baggins (Zavier Tanner) who finds himself compelled by the wizardry of Gandalf the Grey (Derek Usher) to join Thorin Oakenshield (Liam Sullivan) and his minions on an adventurous journey that leads them through several encounters with goblins, trolls, spiders and a creepy Gollum (Ginny Thingvold) to the ultimate battle with Smaug the Dragon (Ted Staunton). But then, when things seem like they couldn’t get any worse, they do. The stagecraft that went into the round hobbit door is stunning woodwork, and Rob Blackmore and the rest of the team of set designers have done an outstanding job of creating a unique and varied backdrop against which these fledgling actors ply their trade. Faith Toronchuk’s costuming concepts went a long way to enhancing the authentic feel of characters like Bilbo, Gandalf, Thorin, and the Gollum. But where are Bilbo Baggin’s hairy feet? 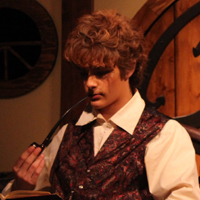 Fortunately, one need not measure a performance by minor details such as this, especially in a Hobbit so full of nuance. One such nuance, Ginny Thingvold’s intentionally creepy portrayal of the Gollum, is itself worth the price of admission, and goes a long way to making up for other less memorable moments of this play. Another actor that merits praise is Ted Stuanton who brings a voluble sense of indomitable bravado to his role as Smaug the Dragon. Overall, this production makes good use of the theatrical space, managing rather well to encompass the breadth and length of a valiant quest in a manner that is not entirely devoid of depth. And if the first half seems to drag at times, the second half makes up for it by being decidedly more action-packed and faster-paced. Aside from the overdone war tableaux and a few other equally sedate struggles our heroes undergo along the way, Director/Producer Faith Toronchuk has managed to garner some golden performances out of her troop of amateur actors, several of whom may one day rise up through the professional ranks.